It's that time of year again. School's out and the latest installment of Sharknado crashes into the tellybox. Why is it so popular? Perhaps because like a Pot Noodle, it has the calorific content of a tea towel, but tastes SO good, especially because you know that you shouldn't. Who can resist a Bombay Bad Boy or a film with a preposterous setup (and Syfy does this subgenre SO well - from Nazis in Antarctica to reptilian cyborgs and piranhacondas that outham Jon Voight's scenery chewing in Anaconda. All rich terrain particularly for ex-popstars, Tiffany isn't alone anymore. And of course the final ingredient: loads of weaponry and inventive ways to off the mutant beastie of the week. Till the (inevitable) sequel. 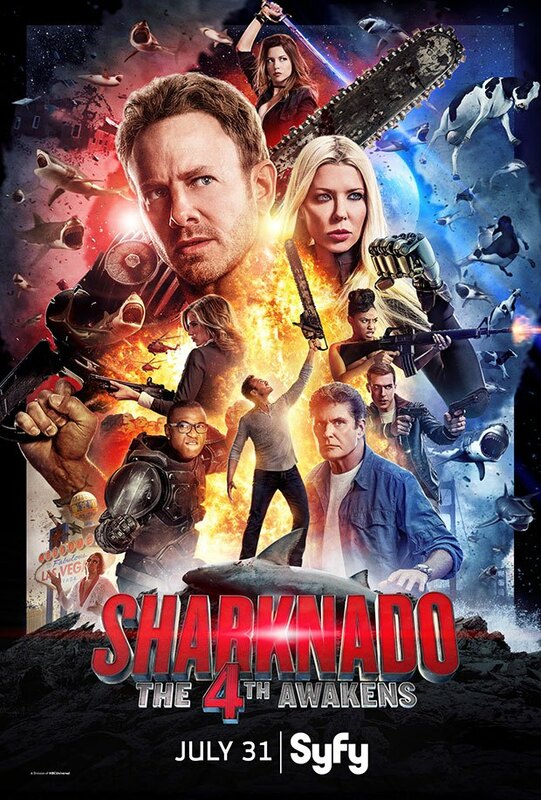 Sharknado 4 offers zero originality but therein lies the guilty pleasure of it. Just sit back and enjoy the ride. Oh, I'd give it 4* at least! Love Sharknado franchise! Bitesize reviews from a multiplex or arthouse near you. Copywright Kim Milward. Awesome Inc. theme. Powered by Blogger.